Created in 1932 by Jerry Siegel and Joe Shuster, Superman has become one of the greatest cultural icons in American history. Sworn to protect truth, liberty, and the American way, Superman was the last survivor of the doomed planet Krypton who came to earth as a baby. When he grew up, he gained numerous superpowers, including super-speed, flight, heat vision, and invulnerability. In his nearly 80 year existence, he has inspired countless comics, movies, television shows, and ordinary people to do their best every day. As one of the first superheroes, he has become a template for other characters, be they homages, doppelgangers, or rip-offs. Here are ten such characters, presented in the order of their first appearance. There have been several Ultramans throughout comic history. But the one that is mentioned here is the evil counterpart of Superman from Earth-3, a parallel universe of the DC universe where all of the heroes were evil and vice versa. The original Ultraman was a member of the Crime Syndicate, the evil version of the Justice League. Unlike Superman, he grew stronger with exposure to Kryptonite. The original Ultraman died during the DC crossover event Crisis on Infinite Earths in 1985. In post-crisis history, Ultraman and the Crime Syndicate of America were rewritten to be the Justice League’s counterparts from the Antimatter Universe. Whatever his origin or explanation, Ultraman remains one of Superman’s most powerful, and persistent, foes. Trying to unravel the history of Hyperion is a mind-numbingly difficult task, as there have been five completely different versions of the character in the Marvel Universe. To make things simple, this entry is about only one of the those versions: the Hyperion from Earth-712. This Hyperion is a member of the Squadron Supreme, a superhero team that was created by Roy Thomas and John Buscema that was based off the flagship characters from their rival company, DC comics. The Squadron Supreme has been known to traverse the different Marvel universes, occasionally coming to fight the Avengers from the main Marvel Universe, Earth-616. However, they are most known from their self-titled 12-issue miniseries written by Mark Gruenwald. In it, the Squadron Supreme, led by Hyperion, tried to remake their world using their powers and knowledge into a utopia. But their attempts at remaking the world led to them creating a totalitarian state with themselves as dictators. Created by Rob Liefeld as part of his Image Comics imprint, Supreme was originally an incredibly violent version of Superman. The idea was that Supreme would be Superman if he lacked his incredible moral code. However, Supreme was rebooted by legendary comic book writer Alan Moore into a tribute to Superman during the Silver Age of Comics. Considered one of the most brilliant and ingenious reboots in comic history, Moore based his storylines and characters off classic Superman comics. He introduced new characters like Supreme’s sister Suprema (a homage to Supergirl) and Radar the Hound Supreme (a homage to Krypto) By doing this, he was able to take a modern day spin on classic comic book stories and archetypes. His run won the 1997 Eisner Award for Best Writer and is considered to this day to be a masterpiece of comic book meta-fiction. Mister Majestic was a character that was deliberately designed after Superman. As such, he is one of the most powerful heroes in the Wildstorm universe, an independent comic book company that was purchased by DC in 1999. Mister Majestic was a warlord and commander of a massive alien warship that became stranded on earth. As such, he is a brutally violent character stemming from his militant lifestyle. Thankfully, after coming to earth he swore to fight against the forces of evil. Being able to live for thousands of years, he has influenced human history for generations. He finally settled down by becoming a costumed hero and joining the superhero team known as the Wildcats. He has a massive ego that stems from a severe superiority complex. Mister Majestic is another example of a writer inverting the Superman archetype by imagining what someone of such power would be like without his moral beliefs. Much like Mister Majestic, Apollo is a Superman-type character originating from the Wildstorm universe. Much like Superman, he is powered by the sun’s rays. At full strength he is nearly invulnerable and can shoot blasts of heat and light. He was originally a mutated human who had been designed to be a part of team to rival the Stormwatch, one of Wildstorm’s superhero teams. However, he was part of a mission that went horribly wrong that killed almost his entire team. Managing to escape, he joined the Authority, yet another superhero team, along with his lover, the Midnighter. Although not technically the first, Apollo was among the very first openly gay superheroes in comic books. 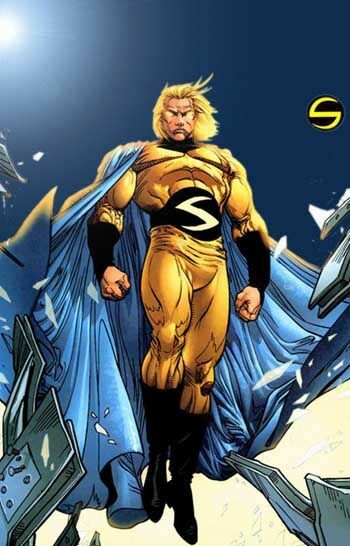 Much like Hyperion, the Sentry is the name of several different characters in the Marvel Universe. For this list, I have chose the most prominent incarnation of the Sentry, also known as Robert Reynolds. The Sentry has one of the most bizarre publishing histories of any character in comic book history. Although first introduced in 2000, he was retconned into having been a prominent member of the Marvel Universe since its inception in the 1960s. However, an evil power known as The Void had caused the entire universe, including the superhuman community, to forget him. After regaining his memory, he had to defeat The Void while regaining his long-lost friendships with characters like the Fantastic Four, Spider-Man, Hulk, and the X-Men. He has since gone on to be one of the most powerful characters in the entire Marvel Universe, even managing to kill Ares, the Greek god of war. However, his incredible powers are hindered by acute mental illness, including severe schizophrenia. 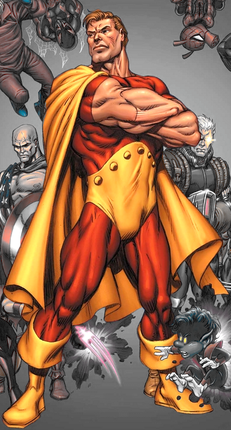 Omni-Man is the father of the superhero Invincible, a character in the Image Comics Universe. He has the usual grocery list of Superman-esque powers. However, he also possesses a massively increased lifespan. At first he is depicted as a stalwart defender of earth and a consummate family man…at least until he kills the rest of the planet’s heroes and announces their subjugation to the Viltrumite Empire. The Viltrumites are a humanoid alien race who are among the most powerful in the universe. Omni-Man was assigned with conquering the planet. As such, he became an opponent to his very own son. However, he has since redeemed himself by siding with the planet earth in the Viltrumite Wars wherein he destroyed their home planet along with his son. Astonishman is a character in The End League, a comic book series published by Dark Horse Comics. The point of the series is that the war against evil has failed. Supervillains have conquered the earth and the last few superheroes have been forced to band together. They are led by Astonishman, originally a government employed hero who fought in World War Two. However, as time went by, he grew more arrogant. In May of 1962, he was tricked by the villain Lexington into attacking a nuclear warhead on the ocean floor, devastating the earth. Astonishman was powerful enough to shift the earth’s gravitational cycle. He is able to fly six times the speed of sound and has enhanced senses that are so powerful that he can scan the planet in seconds. Alpha One is a creator-owned property of DC comics that exists within his own universe. Within his universe, he was the first and only Super Hero. He has all of the standard Superman powers. However, as his world’s only superhero, he is assisted by Section Omega, an entire police force whose sole goal is to help him seek justice. He has so far only appeared in a 12 issue limited series. However, Paramount has recently acquired the rights to his character, so a movie featuring this mighty character is not out of the question. 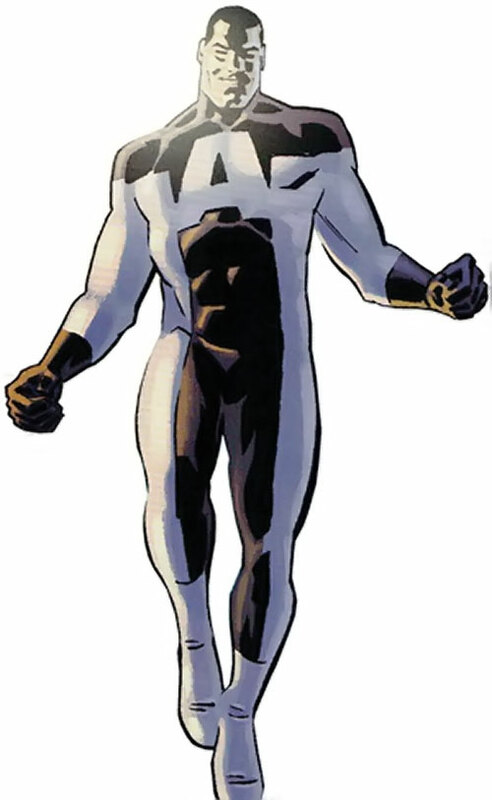 The brainchild of comic book superstar Mark Waid, the Plutonian is the main character in the comic book series Irredeemable. 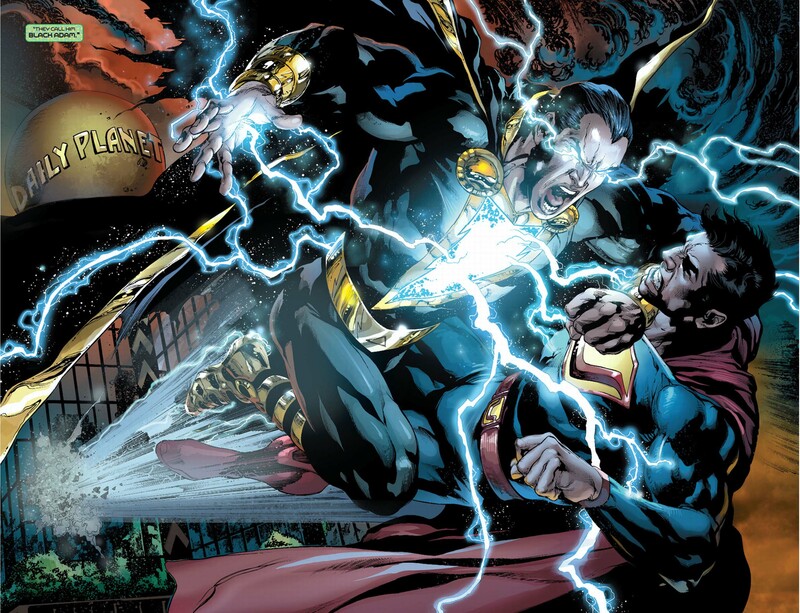 The series asks the question of what would happen if a man with Superman’s powers became a supervillain. In the comic, the Plutonian was originally his world’s greatest superhero, even leading the Paradigm, a group of superheroes. However, his powers grew so great that he could see and hear everything on the planet. As a result, his faith in humanity evaporated. When one of his mistakes leads to the deaths of hundreds of children, he snaps, destroying major cities, killing both former teammates and villains, and killing millions of people. The Plutonian is in essence a tragic character as his inability to face all of his responsibilities and cope with his mistakes leads him to horrific consequences. It still needs to be seen whether or not this “irredeemable” character can, in fact, be redeemed. No Captain Marvel? No Mr. Incredible? That’s true about the Incredibles being more inspired by the Fantastic Four than anything (with a dash of Watchmen influencing their backstory). Captain Marvel, despite the differences, was very much inspired by Superman. I don’t think it’s too tough a call to say that Superman inspired Captain Marvel. I think this was a good list, but I think having Sentry so high on it does not make much sense. Hyperion is a terrible character and I am not sure if anyone really accepted him after his limited series. As a one time concept as Marvel’s greatest hero, taking place in it’s own self contained limited series it worked, but when Bendis and company made him part of the mainstream MU it was ridiculous. And Alpha One and Astonishman? Never heard of ’em. Plutonian is a decent choice for #1, though. The writer went in order of first appearance, from the earliest to the most recent. I haven’t heard of Alpha One or Astonishman, but now I’m tempted to check out the books. I’d have included Astro City’s Samaritan. Right down to the power set. In fact, his given name Kallark is a combination of Clark Kent and Kal-El. Gladiator is a definate addition to the list, as should the utterly corrupted Homelander from The Boys. How about who Superman is inspired by? Clark Savage AKA Doc Savage AKA The Man of Bronze. Has a Fortress of Solitude where he does his inventions to fight crime and as a retreat. Written by Lester Dent in 1933, a year before Superman. A better candidate for Superman’s inspiration was Hugo Danner, the protagonist of Philip Wylie’s Gladiator. That said, Superman had a much happier story. Hugo was a bit of a loser. How is Goku not here? Goku isn’t here because this is about awesome American Superheroes from comics, not lame Japanese Manga/Anime so called “heroes”. Ulti-Man from Big Bang Comics. Also Master Man from Fawcett (sued out of existence by DC), and the earliest one, Wonder Man from Fox (likewise). But I wouldn’t put the latter two on a Top 10 list, though I think Ulti-Man is worthy of a spot. Captain Marvel (my favorite character) was clearly inspired by Superman, but then went off in such different directions from Superman in so many ways. The Void didnt make everybody forget The Sentry, it was Mastermind, The Void was The Sentry’s evil sorta schitzo alter ego. You guys forgot Ultraa, the fist and only hero from Earth-Prime(the DC universe that we inhabit). Gladiator should really be on this list considering he is a DIRECT jab at Superman by Marvel Comics. Also Bizarro deserves a mention. You got photo of the wrong Ultraman. This one is not from DC, obviously. Oh Wow. That is embarrassing. Yes, I know this too. Fixed. Thank you for pointing this out.